Herkimer Quartz is a crystal which is very similar to diamonds. It is found in Herkimer near Central New York state. You can also find them in Middleville, Saint Johnsville, Fonda, and several other towns and villages just north of the New York State Thruway. Herkimer and Middleville are the most popular areas in New York of American collecting sites for quartz crystals. The New York Herkimer Quartz rivals the Arkansas' Hot Springs quartz crystal deposits. In an Arkansas site, a prismatic crystal measures a foot or more in length and a group of crystals weight tons. A Herkimer quartz crystal prism is firmly attached to a matrix measuring three to four times longer than wider. In New York, the crystal deposits do not produce long crystal prisms. These crystals are so much like gemstones, until they are called diamonds. They are stubby and are an inch or two long from end to end. Some crystals may reach as long as four inches. They are formed doubly terminated (ends completed as blades), and the vast majority of these crystals are loose in pockets. Arkansas quartz crystal deposits are different from the New York Herkimer Quartz in that these quartz crystals are found in open cavities that were formed, when the plate tectonic movement caused the sandstone to fold, fault and shift. Algal stromata lites are the remnants of a strange and ancient bacteria growth found in the openings of the Herkimer-area quartz pockets. Magnesium-rich dolomitic limestone, commonly known as dolostone, is the relatively low-content silica solutions from which New York quartz deposits developed. The Arkansas sandstone is not much harder than the dolostone and heavy equipment, as well as much effort is needed to reveal the pockets. These deposits are about 200 million years old and the Herkimer deposits are around 500 million years. Collecting these beautiful Herkimer crystals dates back to before the Europeans settled in the New York area. The Indians used to collect and made spearheads out of them. The early Europeans started collecting these crystals after first settling in the area. In 1792, the revealing of the pockets of these crystals came from the digging of a canal, which led to the other early settlers collecting these gems regularly. Collectors, in this present day, still collect the Herkimer crystals from several fee-digging sites. Historically, the geologic region in New York has the earliest recognized life forms on Earth dating back to 500 million years, that developed in the shallow seas since the beginning of the Cambrian, called stromatolites. They are rounded knoblike bacterial growths formed as isolated units. These inundated muddy and limey depositions gradually died off leaving openings in the hardened mud as this stromatolite decomposed, forming a carbon residue in those openings called anthraxolite, an organic mineral. Dolomitic limestone rock was formed from the limey deposits infused with enough magnesium under heat and pressure and became hardened. The rock's temperature during this time was estimated to be around 350 degrees F. It didn't metamorphose the rock into marble, however, the dolomitic limestone is hard digging. You'll need ten and 20-pound sledges and heavy chisels to wedge apart this limestone. The best part of this New York region is the supply of crystals is still plentiful for collectors, even after 200 years of collecting. It can be quite exhausting digging at the Herkimer mine, so, some people simply choose to do work on the soil and gravel using screens to find nice, perfect crystals and they are always successful. Others work the dumps developed from hardrock diggers hammering and chiseling away the face of the rock walls. This hard and fruitful work sometimes reveals pockets that usually holds dozens, or maybe hundreds of crystals. 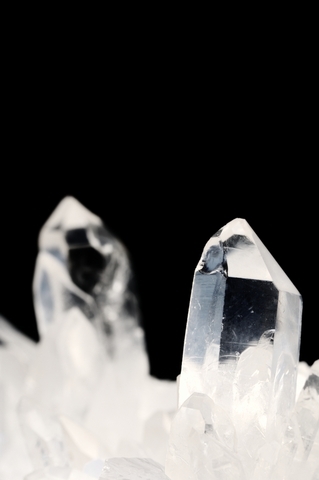 There are three crystal quartz mines in New York that caters to families: the Crystal Grove Mine, the Ace of Diamond Mine, and the Herkimer Diamond Mine. At the Ace of Diamond Mine, camping is available on the grounds and there is a campground near the area. The Herkimer Diamond Mine and the Crystal Grove Mine have campsites and RV camping on their properties. Crystal Grove Mine is on state Route 5 in a town called St. Johnsville, the other two mines, Ace of Diamond and Herkimer Diamond Mines are on state Route 28 and they are not too far from each other. All three mines have nice provisions for the kids, including a playground, gift and rock shops. If you should fail in the field, you can pick up some nice Herkimer Quartz Crystal examples at any of the shops. 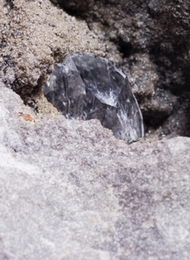 However, you will have success in the field, finding quartz crystals at the Herkimer mine. And you'll see that these crystal jewels really are perfect like diamonds.